In Fall 2011 Cordogan Clark & Associates was the U.S. firm invited to participate in the limited competition for the new China Charcoal corporate headquarters. Our design creates a strong and dynamic new corporate identity. The architectural composition is powerful and iconic. It is instantly memorable from the moment people see it. 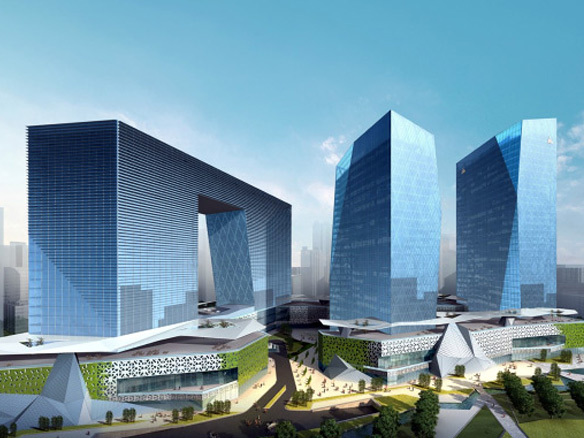 The arch gateway form of the hotel opens to the elegantly faceted glass towers to the north. These three main elements are embraced by a retail base, verdant landscaping, and lively water features that enwraps them to create an enclosed entrance courtyard. The site and architectural massing are laid out for functional efficiency. The site development and architectural organization are the logical consequence of their setting. The hotel is positioned towards the south. This gives it the longest east/west dimension of the site, so its long elevations can face north and south for optimum solar efficiency, while providing excellent views towards Macao and surrounding areas. The site massing rises upwards towards the two office towers to the north. These towers are made tall; with the northern tower reach the height limit of the site, to best announce China Charcoal’s corporate presence. These twin towers also have their dominant elevations facing north and south, for energy efficiency. The north tower extends the full width of the site, defining the site’s northern boundary as the hotel does the south. The hotel and office towers are widely separated and are offset, so that the principal and entrance facades are afforded abundant natural and south light. The architectural massing responds to the shape of the block and the gentle arc of the main street. The main architectural masses align with the street setback, following the arc of the street. The architectural masses radiate subtly as they follow this arc. They define the leading edge of the site, while also presenting greater mass and presence for the entire composition when viewed from Macao.